Ystari Games continues to amaze with their new abstract placing game with twists. 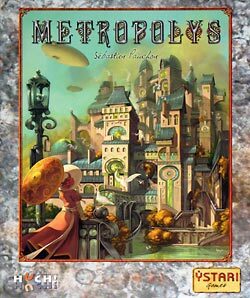 Metropolys might have the least attractive map of all Ystari Games, but its clever 'bidding' mechanic works very well and creates many brainteasing situations for the players. A rather silent 'Thinking Man's' game, but not outstaying, it is welcome with a 30-60 minute game length. This can be especially recommended for anyone who liked the mood of Ystari's first game, 'Ys'.